HomeAbuseCOURTS A TOOL FOR ABUSE? Victims of domestic violence often turn to the court system for justice and safety. But sometimes that system — the quintessential symbol of fairness — is weaponized by abusers. Victims, service providers, lawyers, cops and policy advocates described to Greenwich Time how domestic violence offenders may use the legal system as a new arm with which to manipulate and control their victims. YWCA Greenwich Director of Domestic Abuse Services Meredith Gold poses at the YWCA in Greenwich, Conn. Wednesday, Oct. 25, 2017. YWCA Greenwich offers many domestic abuse services, including a 24-hour hotline, immediate assistance, counseling services, emergency shelter, safety planning, children’s services, court services, and resources for immigrants. In family court, abusers may file motion after motion to force their ex-partners to stay in court fighting them. They may refuse to pay child support or to follow court orders. They may appeal each decision of the court. Abusers may slander their ex-partners with false accusations, or paint victims as mentally ill if they bring up allegations of domestic violence. Each day spent in court can mean wasted time, money spent on lawyer’s fees and lost wages for victims who may be trying to restart their lives after escaping an abusive cycle. 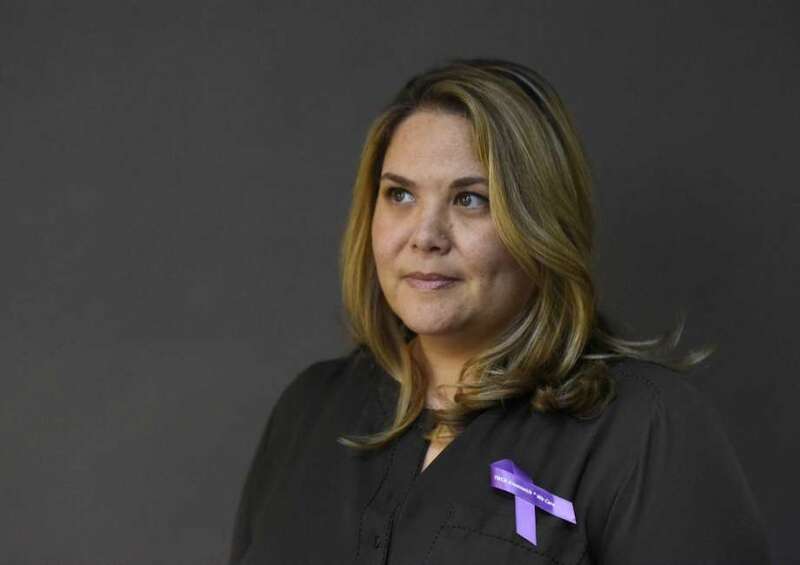 Across Connecticut, the majority of domestic violence victims cannot afford lawyers to represent them in family court, said Karen Jarmoc, executive director of the Connecticut Coalition Against Domestic Violence, an umbrella organization that supports the state’s 18 domestic violence service agencies and advocates for policy change. However, in wealthy areas, like Fairfield County, the ability to afford more lawyers and more litigation can exacerbate abuse cases further. Connecticut Coalition Against Domestic Violence Executive Director Karen Jarmoc poses at the CCADV offices in Wethersfield, Conn. Thursday, Nov. 2, 2017. The CCADV oversees the state’s 18 domestic violence service agencies, including YWCA Greenwich, and works to make changes through policy, advocacy, public awareness and community education at the state and national level. Judges are limited by federal and state laws in what they can do. Judges may craft additional orders or sanctions to protect a victim, if they see fit. But they must allow everyone to defend their rights in court, while attempting to dismiss frivolous litigation. “We’re always on kind of a tightrope to ensure due process,” said Judge Elizabeth Bozzuto, who has been a family court judge for 15 years and serves as chief administrative justice for the Connecticut Family Court Division. Jarmoc suggests Connecticut judges should have more training on domestic violence, conducted by outside experts instead of organized by the judges themselves. At present, all Connecticut judges receive some training on handling domestic violence cases. Of the 14 days newly appointed judges spend in “judge school,” about four days are devoted to domestic violence, said Connecticut Appellate Court Judge Maria Kahn, who organizes domestic violence education for Connecticut judges. In a full day of classroom instruction, judges are taught to recognize typical offender and victim behaviors, and even role play how domestic violence cases may unfold in court. They spend approximately three days observing domestic violence cases in Connecticut courtrooms. In 2015 and 2016, Kahn also prepared a voluntary full-day workshop on domestic violence, available to all judges and taught by local, national and international experts. Kahn said nearly every Connecticut judge attended. “Domestic violence has been at the forefront of the judicial education for more than 10 years,” said Kahn. Jarmoc, who has headed the CCADV for six years, said progress has been made, but there is more to be done. All court personnel — from judges to clerks to family relations officers and prosecutors — need to better understand the intricacies of domestic violence, she said. Judge Bozzuto suggested the system could benefit from “individual calendaring” for Family Court judges. The term refers to one judge sitting through the entirety of a case from first motion to trial. Currently, all motions filed by litigants or lawyers are scheduled as filed, go onto a single general calendar and are divided up between the judges available that particular day. If one judge saw every pleading in a case, fewer individuals would be able to abuse the system with redundant litigation, Buzzuto said. Individual calendaring is used in the Norwich Judicial District. Bozzuto said she hopes it can be expanded to three or four other judicial districts. What service providers term “legal abuse” — offenders repeatedly using frivolous litigation to exercise control over their victims — typically unfolds in family court, where individuals bring the cases. In criminal court, where the action is brought by the state following an arrest, victims receive support from victim’s advocates. Victim’s advocates, employed by the state or by domestic violence service providers, contact victims after their partner is arrested on a domestic violence charge. A free, confidential service, advocates voice the victim’s wishes — for example, what kind of protective order they might want — in court and maintain relationships with judges, family relations officers and other court personnel. They can also answer a victim’s questions about court orders and processes. “We’re sort of the mouthpiece for them,” said Vanessa Wilson, a former victim’s advocate who is the court supervisor with the YWCA’s Domestic Abuse Services. YWCA Greenwich Domestic Abuse Services Manager of Operations Vanessa Wilson poses at the YWCA in Greenwich, Conn. Wednesday, Oct. 25, 2017. YWCA Greenwich offers many domestic abuse services, including a 24-hour hotline, immediate assistance, counseling services, emergency shelter, safety planning, children’s services, court services, and resources for immigrants. Advocating for victims’ wishes has grown harder in the Stamford Superior Court due to changes in how domestic violence criminal cases are heard, Wilson said. Previously, one judge and prosecutor heard all domestic violence criminal cases during specific sessions during the week. In meetings prior to the court date, the Department of Children and Families, family relations and probation officers, the victim’s advocate and the prosecutor would discuss their recommendations for the judge. In many other courthouses in the state, cases on the domestic violence docket still are handled in their own courtroom, apart from others. But Stamford judges now hear domestic violence cases sprinkled amongst all other criminal matters, instead of separating them into a distinct group.